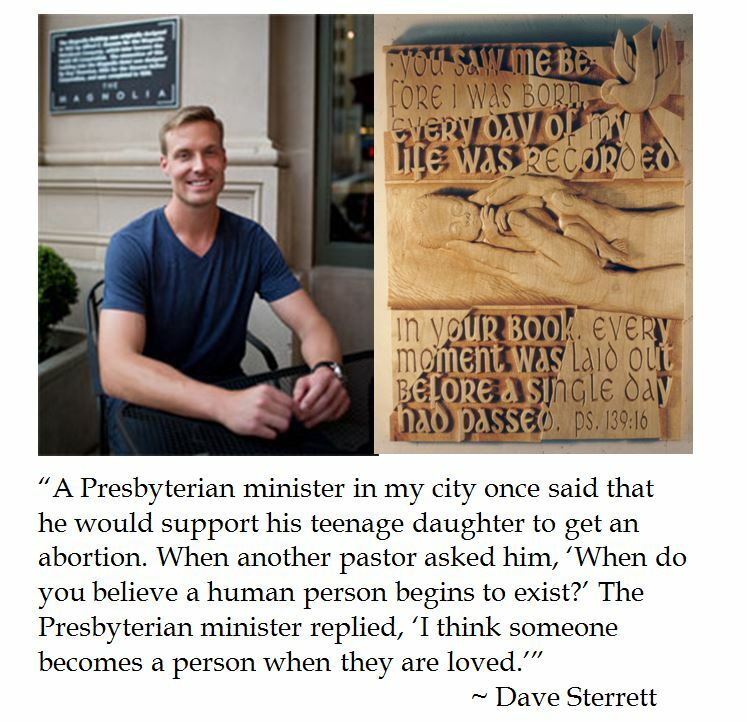 Dave Starrett shared this shocking contemporary conceit from a Presbyterian minister on when human life begins. This shocking conclusion that value of human life is contingent on whether it is loved illustrates the challenge Presbyterians have struggled with about abortion. While a 1992 General Assembly document asserts that: "The considered decision of a woman to terminate a pregnancy [by abortion] can be a morally acceptable, though certainly not the only or required, decision." yet the same document affirms that all life is precious to God and we are to preserve and protect it. It seems hard to fathom that it may be morally acceptable for a mother to abort an unloved child or unwanted child in the womb and square it with the precepts expressed in Psalm 139. Starrett took his concern for the worth of unborn children to another level when he shared his perspective with Planned Parenthood chief Cecile Richards during a chance airport encounter.